I promise an upright picture is forthcoming, but I enjoy wine labels that are head-turning. They fill me with Label Lust. 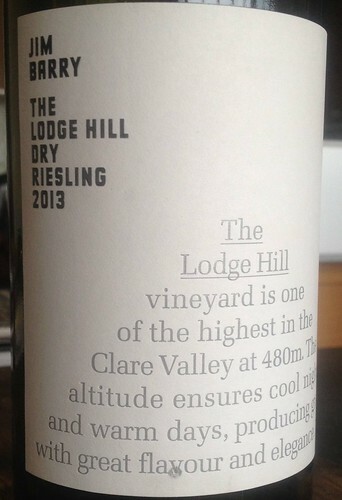 Like this one for the 2013 Jim Barry The Lodge Hill Dry Riesling. I love how the pyramid of words creates and reinforces the vineyard on a hill and gives you a nice tidbit of information on why this wine is distinct. I also thoroughly enjoy anytime I get to type “flavour” instead of boring old “flavor”. It just add a lot more color colour to the English language, no? Have you ever had dry Riesling with a green bean casserole pizza? The Lodge Hill is dry (Duh. ), snappy, and refreshing. If you need a Riesling Recalibration, this wine will give you an attitude adjustment. As a bonus, The Lodge Hill, and Australian Riesling in general, stays remarkably fresh even after being open for days. (If you can hold off that long.) It’s a great wine for seafood, vegetables, and when you get home from the gym. If you can’t find the Jim Barry, just look for any Riesling from the Clare Valley and you’ll get similar results. Incidentally, it’s also pretty cool to drink a wine whose vintage is the current year. Thank you, Southern Hemisphere white wines! 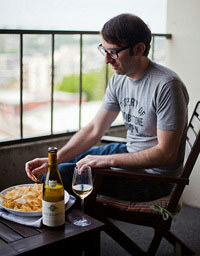 Get more Label Lust, Oregon-style, with Evolution Sparkling and Chehalem Pinot Noir. This season 15 leaders from Seattle’s art and creative communities will assist OtB’s team to bring new voices and perspectives to our programs. Three Ambassadors will unite for a two-month cycle and will help shape the dialogue around the art on our stages via discussions, interviews, essays, curating 12 Minutes Max, designing special events and more. Ambassadors were selected to represent the depth and breadth of Seattle’s cultural community to further animate conversations across complementary sectors and to highlight what makes our community so distinct. You can read my thoughts about a recent performance, The Clay Duke, on the OtB blog.